Panch Prayag is a set of five holy river confluences in the Garhwal side of Uttarakhand. According to a legend, as Ganga was descending on earth, Lord Shiva contained its enormous force by dividing it into various streams. After going through five major confluences, River Ganga becomes complete again and surges down to purify humanity. Prayag means confluence in Sanskrit language. Undertaking a Panch Prayag Yatra involves visiting each of these sacred convergences and getting blessed with their purity. Each of the mergers takes place in the most alluring and soothing spots of nature. As the descending streams crash into each other, they create the most beautiful roar, making for an extraordinary experience. The meeting points of revered streams of Ganga are worshipped by the devotees. Bathing at the points of confluences is considered as a religious cleansing and is also considered auspicious before visiting major holy shrines. The last rites for the departed relatives or loved ones can also be performed at theses sacred amalgamations in Himalayas. People undertake Panch Prayag Yatra in order to get their souls blessed at the legendary and naturally amazing sites of the earth. 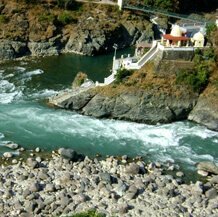 The five sacred river confluences are second most respected phenomenon after the Prayag of Allahabad. En route to Badrinath, Devprayag is the first confluence followed by Rudraprayag, Karnprayag, Nandprayag and Vishnuprayag. Five rivers Bhagirathi, Mandakini, Pindar, Nandakini, Dhauliganga pour into Alaknanda at different locations. The spot where the waters of Satopanth and Bhagirath Kharak glaciers meet is the point of origin of Alaknanda River. The river flows in front of one of the most sacred temples of Vishnu, the Badrinath temple. 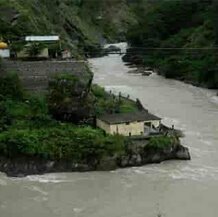 At Vishnuprayag, Dhauliganga, coming from the Niti valley, joins the Alaknanda River, which is also known as Vishnu Ganga at this stretch of the river. This merger takes place at an average height of 1,372 metres, near Joshimath in Chamoli district of Uttarakhand. It is some 38 km from Badrinath. It is said to be the place where sage Narada meditated to seek blessings from Lord Vishnu. Near the joining point is an old Vishnu temple made by Ahalyabai, Queen of Indore, in 1889. About 272 km away from Rishikesh, the octagonal-shaped temple was initially built to house a Shiva Linga, but came to have a Vishnu idol instead. Though the union is gentle, it is a little difficult to take a dip at the ghats because of the strong currents. Over here, Alaknanda River is joined by Nandakini River at about 1,358 meters of height in the Chamoli district of Uttarakhand. As per a popular belief, Nandprayag got its name from the Yadava King, Nanda. His dedication and devotion towards Lord Vishnu at this place, earned him the boon of having a son like Vishnu. And hence he got to raise Krishna (an incarnation of Vishnu) as a foster father. 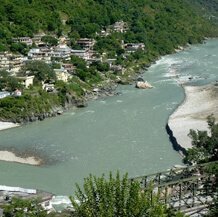 The confluence is 22 km away from Karnprayag and about 194 km from Rishikesh. There is a popular temple of Gopalji (Lord Krishna) at Nandprayag. The wedding of King Dushyanta and Shakuntala is also said to have taken place here. Nandprayag is also a gateway to Badri-kshetra. The area between Satopanth and Nandprayag is known as Badri-kshetra as all the important Badri temples (Panch Badri) are located within this area. 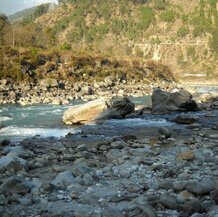 Around 174 km from Rishikesh, Karnaprayag is the place where Pindar River, coming from Pindar glacier, amalgamates with Alaknanda River. 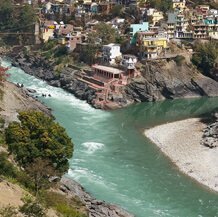 Located in Chamoli district, the sacred confluence gets its name from Karna, the warrier from Mahabharata. As per a widely accepted belief, this is the place where Karna (warrior from Mahabharata) meditated and acquired Kavacha (armour) and Kundal (earrings) from Lord Surya (Sun), his father. It is also believed to be the place where Lord Krishna performed the last rites of Karna. According to Kalidas's Abhijanaa-Shakuntalam, Dushyant and Shakuntala's love affair bloomed at karnaprayag. The great Hindu monk Swami Vivekananda has meditated in this serene and beautiful place for 18 days. There are many shrines lining the ghats of Karnprayag, temple of Uma Devi (daughter of Himalayas) and Karna are the most prominent among them. Rudrprayag celebrates the convergence of Mandakini with Alaknanda. It is named after Lord Shiva, who is also known as Rudra, as many of the legends relate this place with Shiva. A widely promoted legend tells that Shiva performed Tandava here. Moreover, Shiva played his Rudra veena, and with its sound he attracted Lord Vishnu and converted him to water. There is another tale which narrates that the sage Narada once got very proud of his venna playing ability. After he recognised his vanity, he prayed to Lord Shiva for many years at Rudraprayag to persuade Shiva to keep him as his disciple. A black rock situated at the site is believed to be the place where Narada meditated and is called the Narad Shila. There are temples of Rudranath and Chamunda Devi and a steep line of stairs, connected with the temples, leads to the holy confluence. Around 142 km away from Rishikesh, it is at Rudraprayag that the road divide's one goes to Kedarnath and other towards Badrinath (passing by Karnaprayag, Nandprayag and Vishnuprayag). Set in a wonderful natural setting, Devprayag is the last and the most important confluence among the five Prayags of the Garhwal region. Over here Alaknanda meets Bhagirathi after going through the confluences at Vishnuprayag, Nandprayag, Karnaprayag and Rudraprayag, and the sacred river of Ganga finally comes to life. Located in Tehri Garhwal district, about 73 km away from Rishikesh, Devprayag can be visited throughout the year. One can choose to pray and bath at all five prayags, starting from Devprayag, and then conclude the journey with the most sacred darshan of Lord Badrinath. Moreover, a Panch Prayag Tour can be combined with Chota Char Dham Yatra for a more fulfilling and complete pilgrimage tour in Uttarakhand. It is believed that Lord Ram and Laxman did penance over here in order to atone for their sins of killing Ravana, a Brahmin. An old Raghunath temple, thought to be more than a thousand years old, is much revered among the devotees and is one of the 108 Divya Desams. It houses a 15 ft image of Ram, built in black granite. The temple is surrounded by four small shrines on each side, within the temple complex, belonging to Annapurna Devi, Hanuman, Shankaracharya and Garud. Other temples around Devprayag include Dhaneshwar Mahadev temple, Chandrabadni temple, Mata Bhuvneshwari temple and Danda Naggaraja. There is an interesting astronomical observatory belonging to late Acharya Pt. Chakradhar Joshi, an astronomer and astrologer, and contains two telescopes and several books to support research in astronomy. It also contains a collection of about 3000 manuscripts gathered from all across the country. The earliest script dates back to 1677 AD.